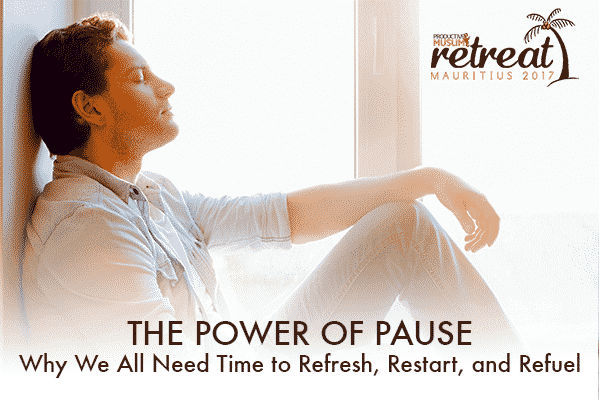 In this article, I’ll share with you why we should pause, why we don’t like to pause, how faith has always asked us to pause, some practical ways to pause in your life, and an opportunity to attend our upcoming retreat where you can pause to refresh, restart and refuel. Imagine driving a car at 100 miles per hour for 24-48 hours straight, not stopping for any traffic light, stop sign, or pedestrian crossing. And keeping your eyes straight on the road at all times. What would happen? You’ll most probably get into an accident, or run out of fuel, or die from exhaustion, or end up in the wrong destination because you didn’t notice the sign that said “Detour”! As insane as the above example sound, for some of us, this is exactly how we’ve been living our lives, always full speed ahead, not taking the time to pause and reflect or enjoy the scenery and the people we’re with. And even if we do pause (usually because we are forced to), it’s done in a hurried manner, as if these moments are obstacles in the great rush of life. Imagine someone stopping you in the middle of your work, or a TV commercial, or when you’re stuck in a traffic jam and asks, “so where are you going?” You can almost imagine the pin drop silence that will take place in your head as you realize the full impact of this question. This is not about where are you heading with your career, or family, or your next pet project, but where are you heading with your life? Look at your life from a 50,000 ft view and tell me where are you going? Pausing and reflecting helps you make conscious decisions that will lead to a meaningful life. The other option is going with the flow, not pausing and reflecting or making the right decisions, and regretting later in life… So, why don’t we take pauses more often? We usually give excuses such as “I don’t have time” or “I’m too busy” or “I have far more important things to do”. But the truth is, we don’t like to pause because it is very uncomfortable! 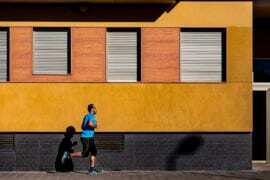 Moments of pause (even for a fleeting few minutes) force us to realize that some of the choices we’re making right now might have undesirable consequences later (e.g. that high-flying career we’re globetrotting for might destroy our family life, not investing in our health and fitness might haunt us when it’s too late, delaying fulfilling our faith duties because of work/family might bankrupt us spiritually… etc). And none of us like to be wrong! How faith encourages us to pause? Pause in our day, 5 times a day, for the 5 daily prayers. Pause in our consumption, once a year through the ritual of fasting during the month of Ramadan. Pause in our spending, once a year, through the ritual of zakat, calculating our wealth and paying 2.5% to the poor. Pause once in our lifetime, for the journey of Hajj, to reflect on where we are in the continuum of History and where we stand in life. Morning pause: Before you start your work day, spend 10-15 minutes pausing and reflecting on how you want to spend your day and the choices you’ll make that day. Evening pause: At the end of your day, spend another 10-15 minutes pausing on how the day went and what would make tomorrow a better day? 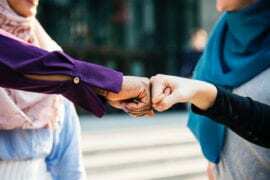 Once a week pause: This is the weekly review that’s recommended by productivity guru David Allen in his Getting Things Done book – and it’s powerful to help you assess all the projects that you’re currently working on. Once a quarter pause: I normally like to work in 3-month chunks (instead of a 1-month chunk) as I end up making meaningful progress on key projects during that time period. But taking the time to pause every 3 months helps ensure that the year doesn’t end without significant progress on some of the key projects in our work plan. Once a year personal retreat: I referred to this above. This is where you head out to somewhere beautiful once a year and take the 50,000 ft view of life and then plan how to actually implement your goals for the following year. It’s extremely powerful! More about this below. We want to replicate last year’s experience on another 5-star resort in the beautiful island of Mauritius this July. We are expecting a lot more participants from all over the world and we’re inviting you to join us as well. 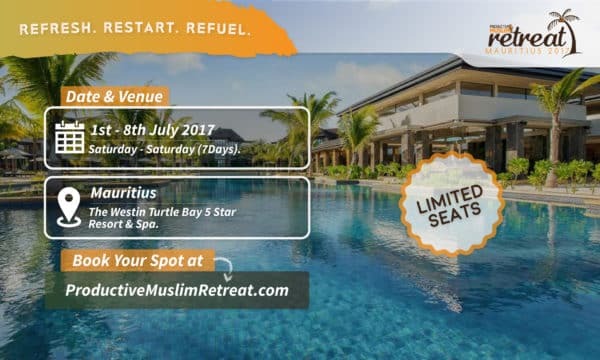 You can find details about the retreat at productivemuslimretreat.com and apply by clicking the “Book Now To Reserve Your Spot” button on the website or by clicking here.